The Fellows and Instructors Association was well represented in Ireland during April. Ballindenisk International Horse Trials were held in County Cork by kind permission of the Fell family. It had FEI classes from 1* to 3* including a Nations Cup team competition. Nick Turner FBHS was there as the Irish team manager, Anne Marie Taylor FBHS had a pupil in the 3* class and was seen training and supporting him. Kylie Roddy BHSI had a successful weekend finishing 2nd in the CCI 1* with Guzzi and in the top half of the large CICO3* class. It was very amusing that several of Kylie’s supporters can lip read because whilst she was show jumping the word which popped out certainly wasn’t fiddlesticks!!!! Jillie Rogers BHSI our chairman, was seen to have writer’s cramp when scribing for the 52 strong CICO3* class for Ground Jury member Ann Bostock BHSI. The event also saw Ireland’s F and I rep Faith Ponsonby BHSI grooming/helping her son in law who was competing. Jim Newsam rode Magennis, bred and produced by wife Emma, and for Faith, Kilcooley Michael, both doing lovely clears cross country. 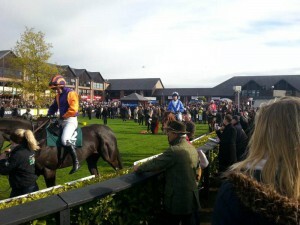 The Tuesday after Ballindenisk was the first day of the Punchestown NH Festival. 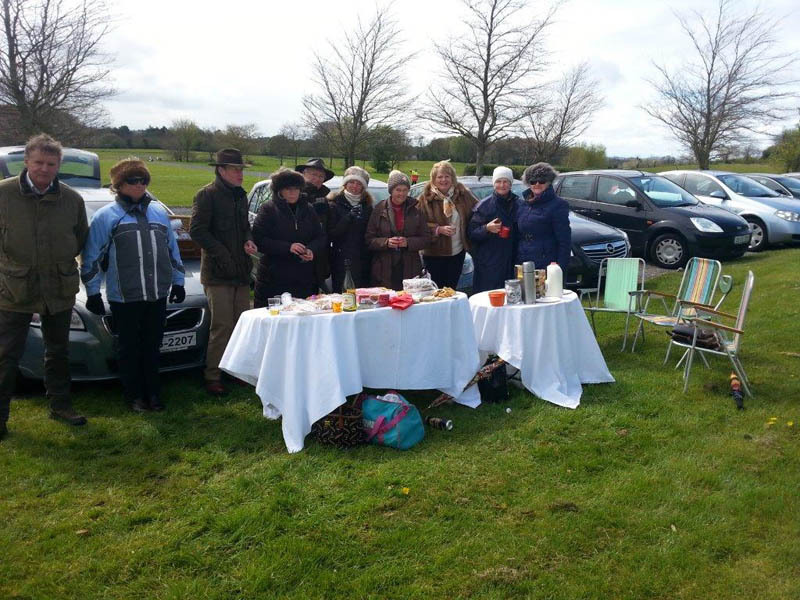 Faith was amazing in producing a picnic for at least 30 people which was held on sloping ground before racing commenced. Jillie made a fantastic cheesecake for which the recipe involves teaching 3 lessons and adding ingredients as pupils change over!! Ann took wine (most important) and very enjoyable evening was had with excellent racing. It is good to see that our members are so versatile and active in the equestrian industry. It was with much sadness that many of us attended the funeral of Margot Tiffany BHSI at St Mary’s Church, Hornby on Monday 20thApril. It was a beautiful day, with the sun out and the temperatures high. The church was as expected full to capacity with many choosing to stand outside and listen to the service of Thanksgiving and Celebrations of Margot’s life. Margot was a passionate advocate of The British Horse Society qualification system and successfully trained innumerable candidates. Her pioneering teaching efforts in China led to two individuals gaining the BHSAI qualification – a source of enormous pride for this dedicated lady.Always able to bring people together in her true belief of the Society’s aims and objectives, Margot volunteered on several County Committees, taking the Chairman’s seat on no less than three occasions for BHS Merseyside, BHS Durham and BHS North East Yorkshire. Margot also served as a BHS Trustee from 2008 to 2011 with particular interests in Qualifications and Training, Education and Welfare. Year after year Margot rose to the challenges facing her, always cheerful, optimistic and skillfully able. 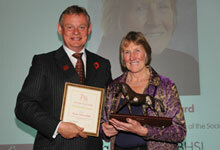 One of Margot’s close friends described her as “Yorkshire through and through – like a stick of Scarborough rock”!The horse world held Margot in high esteem, not least for her wisdom, sense and sensibility – qualities integral to her roles as an International Trainer, Judge and Chief Examiner. Her achievements were recognised in 2012 when she received the prestigious Bodynfoel Award for excellent service in promoting the work of the BHS (pictured). Margot promoted goodwill and collaboration across the equestrian community and her contribution to the continued success of the Society was without question. 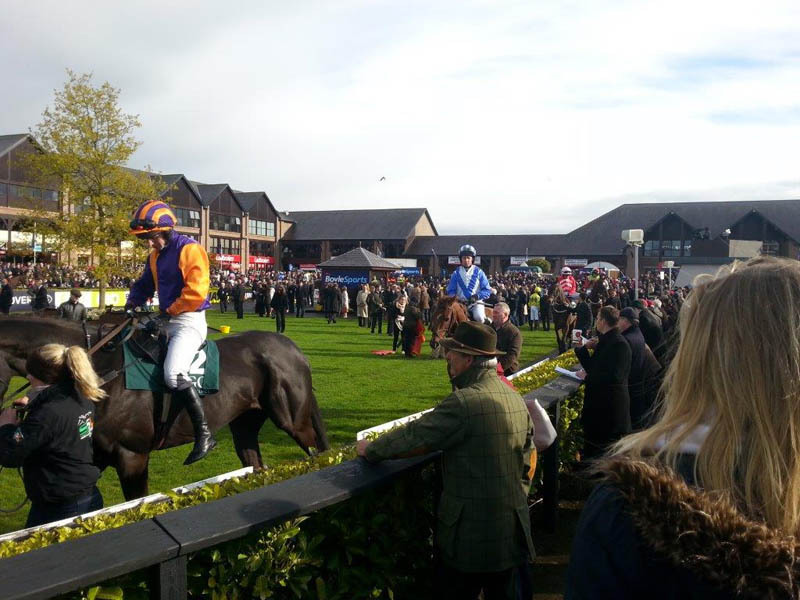 Donations would be gratefully received for the BHS Scholarship fund, please send cheques made payable to ‘The British Horse Society’ and marked on the back ‘Scholarship Fund’ to Laura Pepper, Director of Fundraising, The British Horse Society, Abbey Park, Stareton, Kenilworth, Warwickshire, CV8 2XZ. If you wish to find out any more information regarding this fund please email Laura: laura.pepper@bhs.org.uk or phone 02476840500. The BHS and F & I Association have been shocked and saddened by the unexpected death of former trustee Margot Tiffany BHSI at home on Thursday 9 April. “We are all shocked by the sudden loss of our lovely friend. Margot was one of a kind, beloved by everyone who knew her. A very successful evening was organised by Faith Ponsonby BHSI, Irish Representative, and Jillie Rogers BHSI Chairman of the Association of Fellows and Instructors of the British Horse Society on 7th April. After some refreshments the discussion was complimented by Peter Ponsonby FEI TD, and an authority in cross country course building. Peter gave us valuable tips and advice on the safe construction and securing of cross country jumps and the use of frangible pins. He reminded us that we should be making the most of our local cross country facilities, that are available, but also making us aware that the cross country jump needs to be respected, as should our horses. The evening highlighted that the coach is the strongest link in the enjoyment of our sport, and is key in improving communication between horse and rider.